When the car is smelling musty cut the foot of an old pair of pantyhose and fill it with used - dried coffee grounds. Tie the open end and put in the cup holder overnight. ( line the holder first with newspaper to avoid spills and stains. The absorbent granules will trap the moisture and bacteria responsible for the musty smell, deodorizing the car by morning. Fill a few cotton or paper bags with dry coffee grounds, seal the tops and leave them anywhere you have seen ants- in cupboards near entrances or windowsills or sprinkle loose grounds. The scent of coffee will repel the ants and ingesting caffeine can kill them so they stay away for good. Change the bag every other week or as needed. Dip a damp cotton swap in coffee grounds and use it to lightly dab the area. The tannins will act like a dye concealing the mark. Let dry for a few hours before wiping away any stray grounds and reapplying- the color will darken over time. Combine 1 cup of coffee grounds with 2/3 cup of olive or baby oil and rub the mixture in the problem area for 2 minutes and rinse off. Caffeine has a diuretic effect that dehydrates fat cells, instantly reducing their size and banishing the look of the dimpled skin for up to 12 hours. 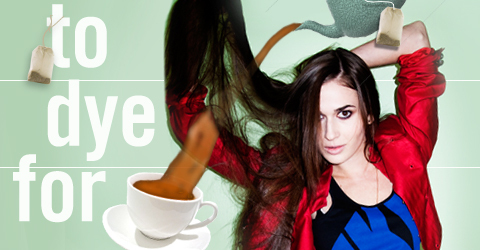 Mix 1/4 cup of coffee grounds with one egg white - massage the mixture into the face and neck. Let dry then rinse with warm water. The coffee small granules will gently buff away the dry skin cells, while the antioxidants will fight free radical damage to uncover a radiant complexion. Plus the coffee and egg white have an astringent properties that will tighten your pores for a flawless fresh faced appearance. Sprinkle damp coffee grounds on the floor before sweeping. 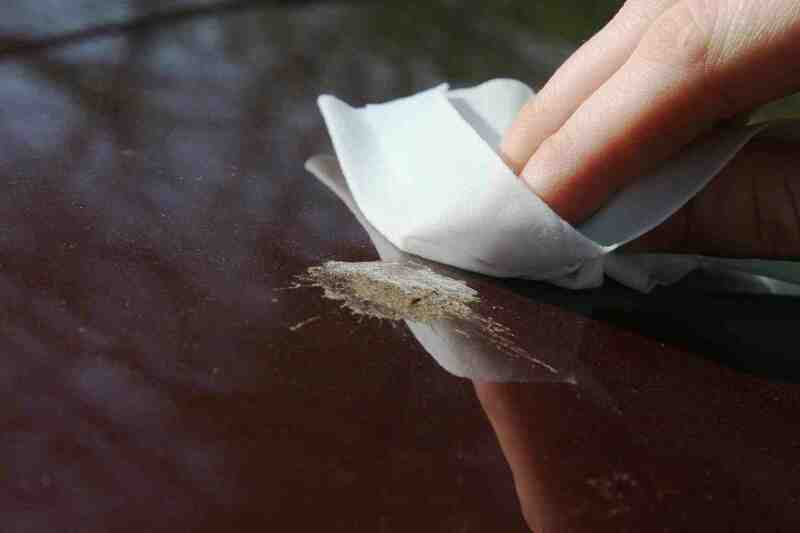 The heavy grounds will prevent the dust from clouding up- so you can sneeze free do the job. Cover the spill with the coffee grounds, the absorbent granules will soak up the liquid, after 15 minutes or so you can sweep away the the grounds and the oily mess with ease. Coat the steak with oil, then rub a mix or 1/3 cup each of black pepper and coffee grounds - decaf when kids are eating. Chill 30 minutes than grill as normal. The tannic acid will gently break down the meat's tough muscle fibers and add a nutty, smoky flavor. 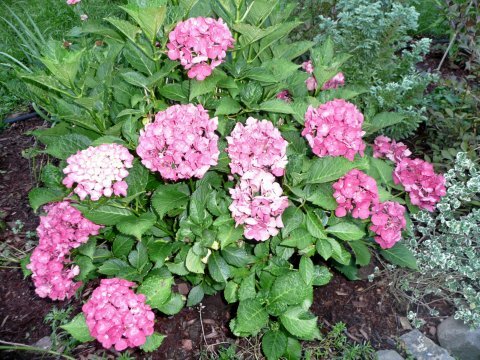 Work a thin layer of coffee grounds into the soil of acid loving plants ( roses-azaleas-camelias-rhododendron) using 1-2 cups every 8 bushes. Coffee grounds contain up to 2% nitrogen, a nutrient essential to healthy growth, plus the low pH will balance the soil acidity to create a healthier environment for developing blooms. Steep 1/4 cup of grounds in 3 cups of hot water and let cool of completely. The tannins will bring out subtle shades in brown hair, and its weak acids will dissolve product buildup to boost volume and shine. Saturate 2 corks with water and seal them with the hard sugar in a re-seal-able bag. Let sit overnight, the wet corks will slowly release the moisture, which will be absorbed by the hard sugar to revive its soft texture. Soak several corks in rubbing alcohol for 1 hr, then put them underneath the logs/charcoal in your fireplace/barbeque and with a long match light them. The absorbent cork cells will soak up enough flammable alcohol to help flames catch and keep them burning strong. Use a cork to make a pour spout. Just cut a small wedge down the length of the cork and slip it into the neck of the bottle. The slimmer gap will prevent overflow, so you can savor every last drop. Put the guard on the screen, then roll a cork from side to side pushing the bubbles towards the outer edges. The firm cork will force out trapped air without causing wrinkles, so the guard will be on in seconds. This will work on any type of protective electronics screen. Safely store sewing needles and pins. Just stick the needles in the cork which keep fingers safe from accidental pricks. Make stainless steel look like new. Dip a cork in some olive oil and use it to scrub the metal. The oil will soften knife-dulling, hard water-mineral deposits, while the cork’s textured rubber surface will dislodge any buildup without harming the steel. Plus the oil will a protective barrier behind that will prevent future buildup and add a nice shine. Water houseplants half as often. Use a food-processor to grind up 8-12 corks, then mix the pieces in with the topsoil. The air-filled cork cells will absorb excess water and slowly release it as the soil dries out, cutting your watering needs in half. Measure the gap and cut a piece of the cork and glue it to the leg. The cork disk will keep the leg steady and the honeycomb structure will prevent from going flat over time. Gluing cork on any furniture will prevent scratching delicate wooden floors. To keep cutting boards and counters free from bacteria without resorting to chemical-laden cleaners, just give the surface a wipe with a paper towels or a clean dishcloth soaked in 3% hydrogen peroxide. The solution will kill salmonella and other harmful organisms, preventing the spread of germs to nearby surfaces. Whiten dirty dingy tile grout. The grout-cleaning combination that works even better than bleach- hydrogen peroxide and baking soda. Combine 1 part peroxide to 3 part of baking soda to make a paste. Scrub it on the grouting with a toothbrush and let it sit for 30 minutes. than rinse with warm water. The peroxide will release oxygen to break down the stain, while the abrasive baking soda will help scrub the marks from the grout's surface. Lift bloodstains from white clothing. Pour equal parts of water and peroxide directly into the affected area. Let sit for 30 minutes than wash as normal. Peroxide will react with the blood to break down the stain, gently erasing the unsightly mark without damaging the fabric (unlike bleach which turns the turns white gray. Safe a scorched tablecloth (Linen light colored). Grab a rag big enough the cover the scorch mark and soak it in 3% peroxide. Lay the rag over the mark then iron on a medium setting until the mark disappears. The peroxide with heat loosens and lift the scorch, while the saturated cloth will prevent the the fabric from more damage. Eliminate between the teeth stains. Regularly dip dental floss in peroxide and floss as always. Peroxide (the main ingredient in most tooth-whitening toothpastes) release oxygen to break down stains and whiten discoloration without damaging the tooth enamel. You'll see improvement within two to three weeks. Extent the life of fresh flowers. Fill the vase with lukewarm water and 1 tsp of 3% peroxide. The antimicrobial solution will kill any harmful bacteria in the water so your blooms can thrive. Stop a blister from becoming infected. Fill a large bowl with equal parts water and peroxide, then soak you feet for 30 minutes before bedtime. The antibacterial solution will kill germs, plus increase oxygen to the injured skin to promote cell renewal and speedy healing. 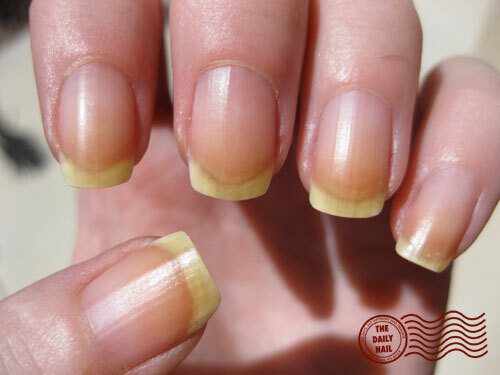 The peroxide will oxidize the pigment molecules in the polish restoring your nails to their natural color. Combine 1 part peroxide to 9 parts water in a spray bottle and generously spritz the fruit / vegetables. Scrub with a vegetable scrubber than rinse. Peroxide is study-proven to eradicate E.coli and other bacteria, guaranteeing your produce is safe to eat. Green up a yellowed plant. When the leaves of the indoor plant start turning yellow - a sign of root rot. To help them bounce back first repot the plants. then water the soil with a solution of 1 cup water and 1tbs and 2 tsp of 3%. Continue doing this even after the plant is healthy. The antimicrobial peroxide acts as an oxygen supplement, with will aerate the soil and nourish the plants. Apply 1/2 a cup of apple cider vinegar and gently massage it into the scalp, then rinse thoroughly with cool water. The alpha hydroxy acids in the vinegar loosen the buildup of the sebum that causes the embarrassing scalp problem. Within a day or two you will be dandruff free. Turn yellow plant leaves green. 2 tbs of apple cider vinegar in 1 liter of water then put it on soil as soon as you notice the leaves change color. Do this once a week for three weeks. The solution will lower the pH level of the soil by increasing the acidity. correcting the color change. Pour 1 tbs of vinegar onto a damp cloth and dab at the marks, starting at the edge working your way towards the center. The Acid will neutralize the slat particles, removing the stain without damaging the wood finish. To balance out a blotchy tone, combine 1/2 tsp of vinegar in 1/2 liter of chilled water, soak a washcloth in the solution and gently run the affected area. The fruit sugars in the vinegar will easily slough away loose dead skin so you can get to your naturally glowing self. Soak the sweaty feet in 1/3 cup of vinegar mixed with 1/2 cup of warm water for 30 minutes: repeat nightly until the problem subsides. The acetic acid in the vinegar will deodorize the feet so everybody in the house can breath easier. Apple cider vinegar and water foot baths are also a none invasive treatment of athlete's foot, and other fungal infections on the feet and other parts of the body. Stop a nosebleed in seconds. bleeding nostril, slightly tilting the head forward. The vinegar will help coagulate the blood and it flowing out. The tart taste interrupts the the nerve-impulse patterns that cause the spasms, so you can breath without the blips. Make cheap beef taste expensive. Marinate the beef in 2 cups of apple cider vinegar for 1 hour before preparing and cooking as usual. The acids in the vinegars breaks down the tough muscle fibers , making the meat more succulent. Bonus: the vinegar will enhance the flavor and give the dish a slightly tangy taste. For small pets (dog) add 1tsp to it's drinking water daily. For larger pets (horses) add one cup to it's drinking water daily (prevents also pesky flies and mosquitoes bothering the horse. The vinegar is high in potassium, a mineral that helps maintain the healthy glow of the animal's coat. Plus the acids will add a subtle scent to the dogs sweat , which act as a natural deterrent to fleas. Apply a gauze soaked in Apple cider vinegar and apply it to the sore spot. Secure with a bandage and leave it on for 1 hour. The acid in the vinegar will increase blood flow to the skin's surface, discouraging a cluster of red blood cells from forming so it won't leave a unsightly telltale mark. Since paint cans, bottles of cleaning spray and jugs of laundry detergent aren’t transparent, it’s impossible to at a glance if you’re running low. Use a thick rubber band as a fluid marker. Just position one around the outside of the container and move it down as you use more of the liquid. That way you’ll always know how much you have left and when you need to add the product to the shopping list. To keep the shirt from sliding, wrap rubber bands around both ends of the hanger. The “sticky” rubber will grip the fabric without damaging it. To spare furniture from scratches of the tossed remotes wrap a small rubber band around each end of the remote controls. The cushioning between the devices and he tabletop will provide enough of a buffer to prevent scratches, scuffs and nicks. Simply place a rubber band around the cap, then twist as usual. 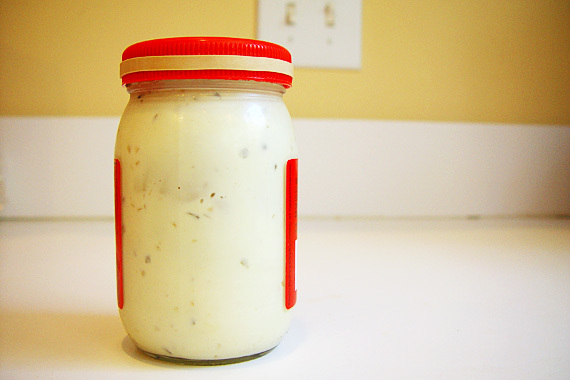 The rubber will allow you to get a better grip on the lid so you can open the jar without breaking into a sweat. 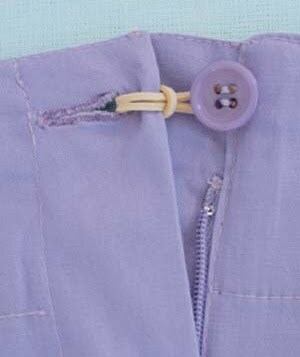 Unbutton the pants and feed a rubber band through the button hole then through the band itself. Loop the band around the button to fasten. This will extent your waistband so you can breathe easy. If the bristles of the broom are starting to splay, dampen them with a paper towel and slip a medium size rubber band around them let it sit overnight. The rubber band will pull the bristles in and “retrain” them to stand straight. The result: a broom that looks- and works-like new. With all you do in the car, it’s easy for sometimes-used essentials to get lost in the shuffle, the fix? Then tuck your ticket under the bands, along with essentials like money, printed directions and maps. 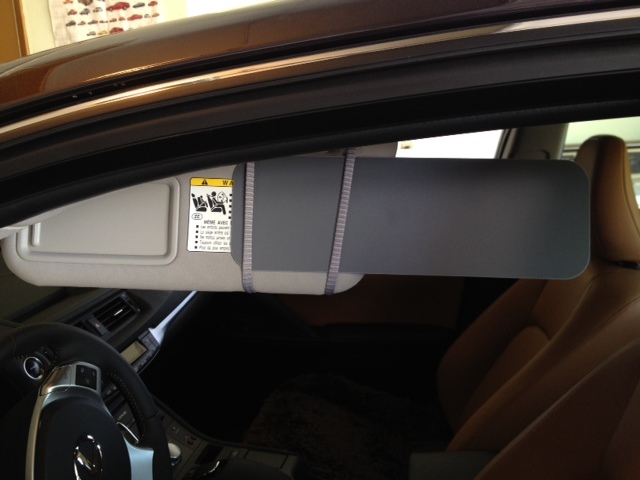 The stretchy bands will keep everything easily accessible. When you need to have slice apples ahead of time they will get brown. Keep the slices together with a rubber band and place it in a zip-lock bag. To stop the racket, tightly wrap a few rubber bands around the end of each slat, starting about 1 cm from the edge. The rubber bands will buffer the metal parts to prevent the squeaks and creaks from occurring, so you can sleep peacefully through the night. You worry some food might spill on the ride over. To easy your fears, stretch a rubber band under the pots right handle and around the left side of the lid’s knob. Repeat with the left handle. The rubber band will secure the lid, so your dish will make it to the destination in one piece. Use a rubber band to remove stripped screws. Remove the drawers and rub soap slivers over the tracks. 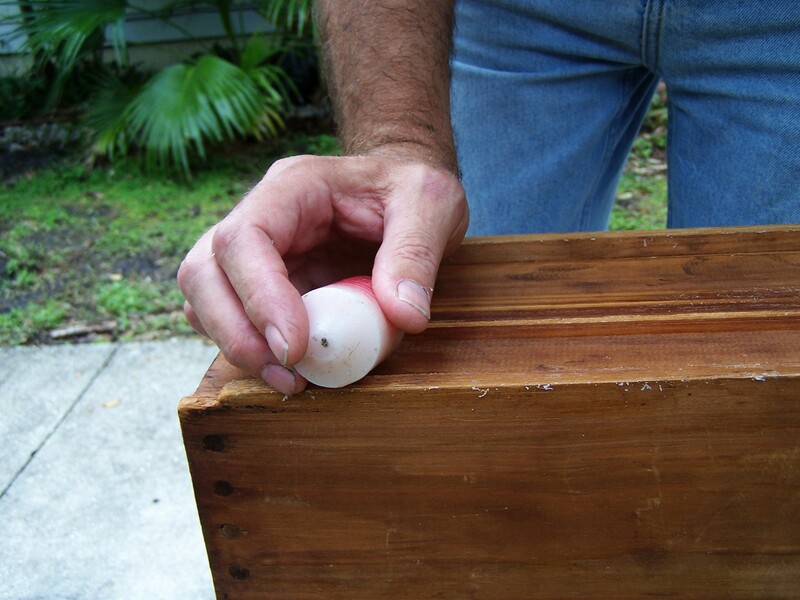 The soap’s oils will lubricate the wood to guarantee a flawless glider every – time even on the most humid days. Toss a handful of soap slivers in a (paper) bag, poke a few small holes in the sack and staple the top closed. Then slip the sachet into the storage container or drawer with your clothes. The soap’s fragrance will repel the moths and other sweater loving pests- and save you the hassle of mending your garments in the spring. To ease the itch after bitten, gently rub dry soap slivers over the affected area. The sodium hydroxide in the soap will seep into the skin and dry out the bite for instant relief. 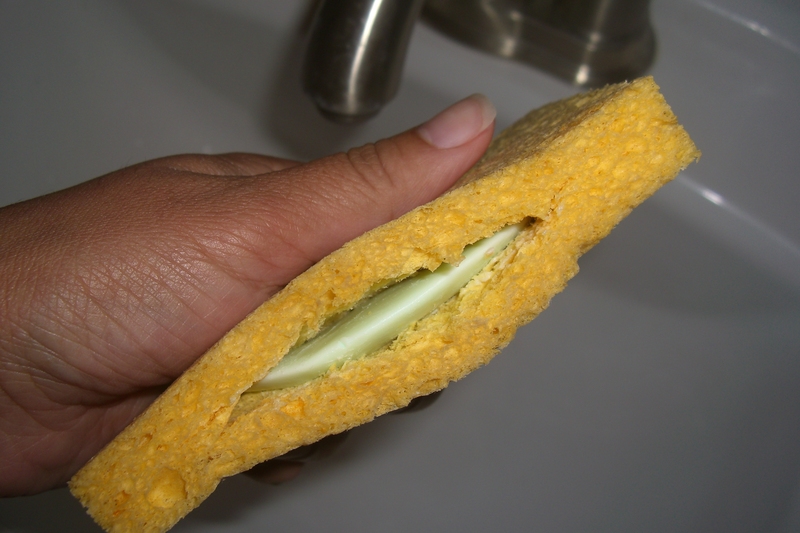 Cut a small slit in to the bottom of a clean bath sponge, then wedge a small piece of the soap bar inside the opening, run warm water and wash as usual. 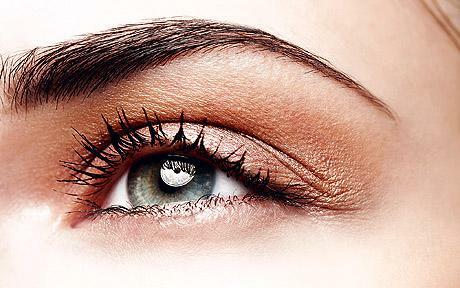 Rub a damp eyebrow brush (or your finger in a pinch) on the soap than comb through the brows. The waxy substance keeps hairs in place all day. Sew thick fabric with ease. To prevent pricked fingers while working with denim rub the soap into the needle before you get started. Simply scrape the nails over a soap sliver before doing the job ( like gardening). The waxy residue will fill in the crevices under the nail beds, creating a barrier that will keep out the dirt and make washing up a breeze. 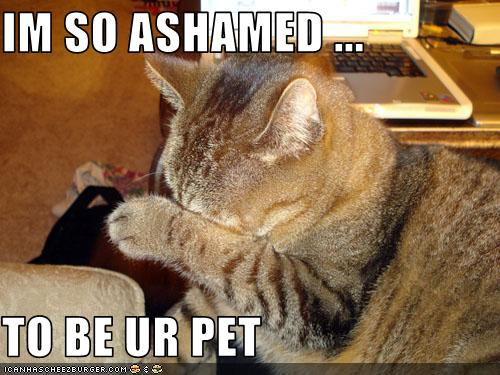 If your pet has been gnawing on the electrical cords thwart the dangerous habit by rub bing soap slivers over the wires. After a few licks of the bitter coating your pet will realize that the wires aren’t a suitable chew toy. Don’t worry about him getting sick- the miniscule amount of soap ingested won’t harm him. Save the pieces until you have enough to fill a jar halfway, top off with warm water and wait until the soap turns into jelly (3 minutes) before stirring. 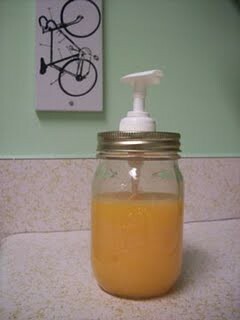 Store the jar in the laundry room and massage a dollop onto stains prior to washing. This homemade pretreatment will lift and suspend stain molecules so your clothes will come looking out new. Deter animals from eating your plants. Scatter soap slivers on and around the plants your animal invaders nibble on the most. If you have a sticky zipper here is what you can do to make the zipper work better. A bar of soap can do wonders with a sticky zipper. If you can get the zipper to close then you can take the bar of soap and just rub it up and down on the zipper. It helps if yon can rub the bar of soap on both sides of the zipper. After you have rubbed the zipper down with the soap then try to open and close the zipper several times. You should feel that the zipper is working better but if it isn't you can repeat the process until the zipper works right. The soap lubricates the zipper so it can move freely. The beverage contains nourishing minerals like potassium bicarbonate-disodium phosphate and sodium citrate, that will enrich the soil and help your potted plants flourish. Simply pour club soda on it screw and let sit for 5 minutes before trying to open it again. The carbon dioxide that will make the beverage fizz will react with the rust and the sediment buildup, bubbling away so you can turn the hardware with ease. While the cookware is still warm, pour just enough club soda to cover the bottom, then let sit while you eat. The carbon dioxide win the beverage will soften the food particles, keeping the mess form sticking, making the washing up a breeze. Substitute the milk or water with club soda in your waffle and pancake recipes. The bubbles in the soda will aerate the batter to produce a lighter fluffier stack. You also save 140 calories for every cup of whole milk you cut out. Simply pour the liquid from the can on a clean soft cloth and use it to wipe down the metal. The soda’s carbonated molecules will fizz away grime without leaving lines of spots in its wake. Fill the cup with club soda overnight. The carbonic acid will eat away the stain leaving the cup look like new. Swap club soda for the cold water. The bubbles caused by the carbonation will add eye-catching sparkle to the dessert, plus give it a surprising fizzy kick. 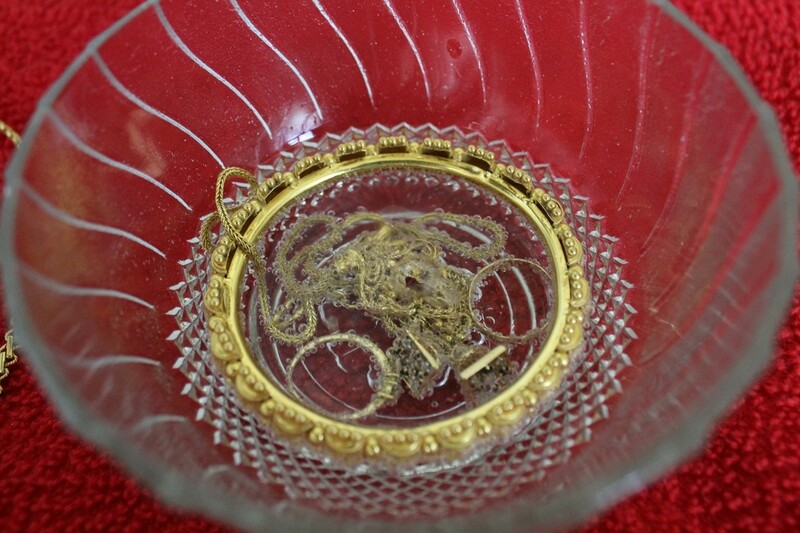 Instead of buying pricy cleaners just place the dulled pieces in a cup of club soda. The fizzy beverage will safely loosen dirt and oils. A nd since the bubble can seep into every hard-to-reach crack and crevice you do not need to scrub with a brush. Simply leave them overnight to soak and gently dry in the morning. Pour soda into a spray bottle and spritz on the soiled area (like windshield – floor- window), let sit for a minute and wipe with paper towel. The carbonation will dissolve the grime so it comes off with a single wipe. Spritz on wiper blades to reduce streaking on rainy days. If after cleaning up your pet’s accident there is still the smell of urine you need to neutralize the odor so a repeat doesn’t occur. Saturate the area with club soda and leave to soak for 5 minutes before blotting it with (paper) towels. 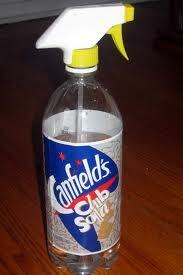 The soda’s minerals will safely deodorize the spot. CD towers have become obsolete. Turn on its side for extra storage. You can empty the contents of glow sticks into jars filled with water and use them for fun lighting during a party or even during Halloween. Find out how you can make your own solar panel from aluminum cans. 5 THINGS YOU PROBABLY NEVER KNEW YOUR MOBILE PHONE COULD DO.. Turn that old shirt into an apron... clever!